6 (5b) Each one should be fully convinced in his own mind (14) As one who is in the Lord Jesus, I am fully convinced that no food is unclean in itself But if anyone regards something as unclean, then for him it is unclean (16) Do not allow what you consider good to be spoken of as evil (22,23) So whatever you believe about these things keep between yourself and God. Blessed is the man who does not condemn himself by what he approves. 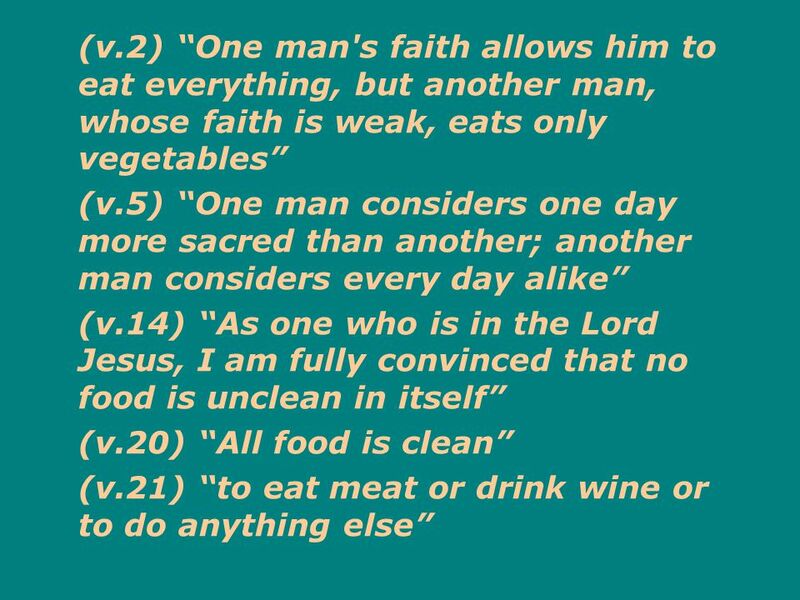 But the man who has doubts is condemned if he eats, because his eating is not from faith and everything that does not come from faith is sin. 10 B. 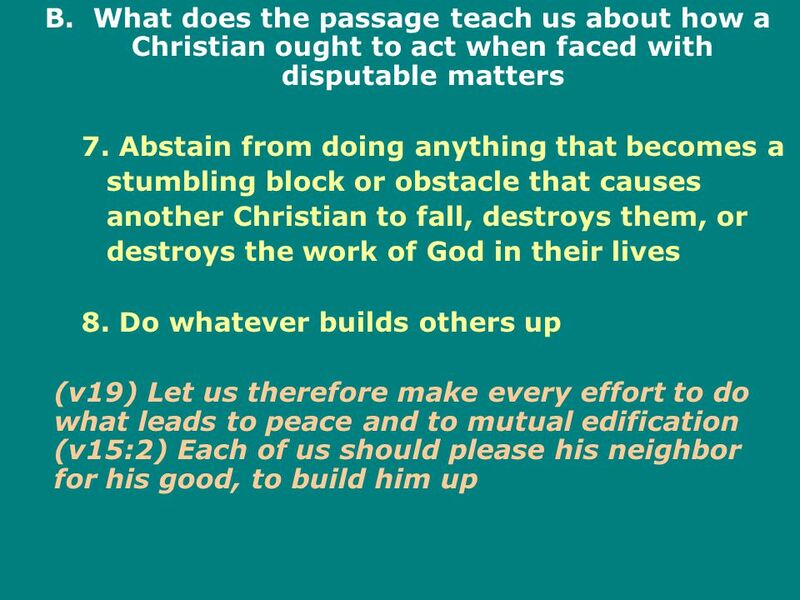 What does the passage teach us about how a Christian ought to act when faced with disputable matters? 1. 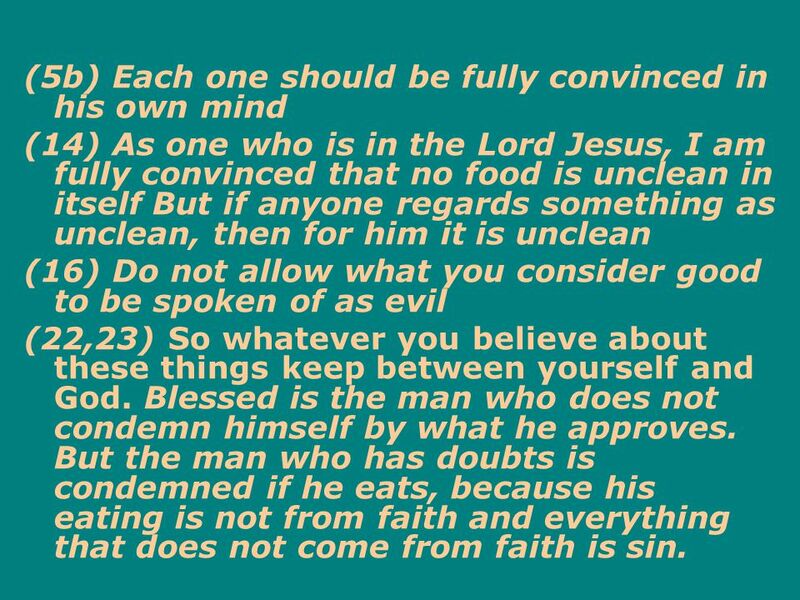 Be fully convinced about the issue in your own mind before God, so that you do not sin and condemn yourself by what you approve 2. Act in love 3. Please others for their good, not yourself 4. Carry the burdens of the weak (v15:1) We who are strong ought to bear with the failings of the weak. 12 B. 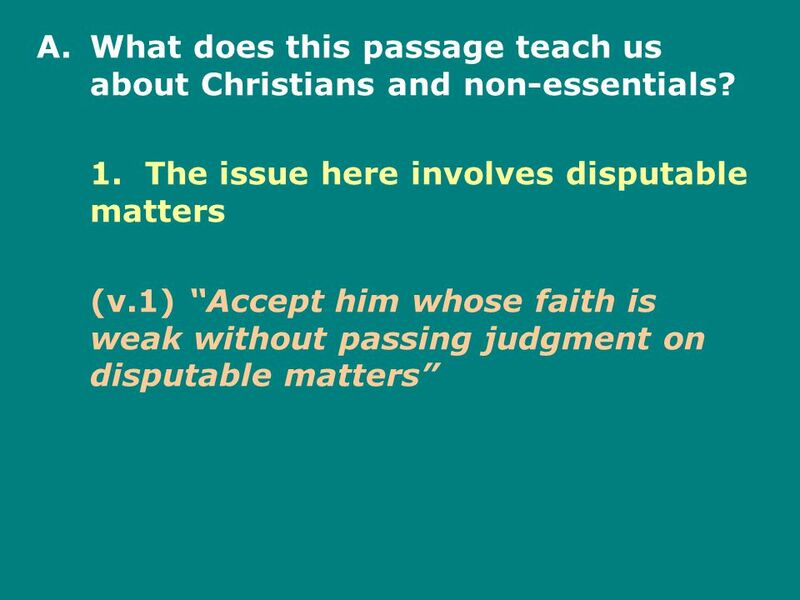 What does the passage teach us about how a Christian ought to act when faced with disputable matters? 5. 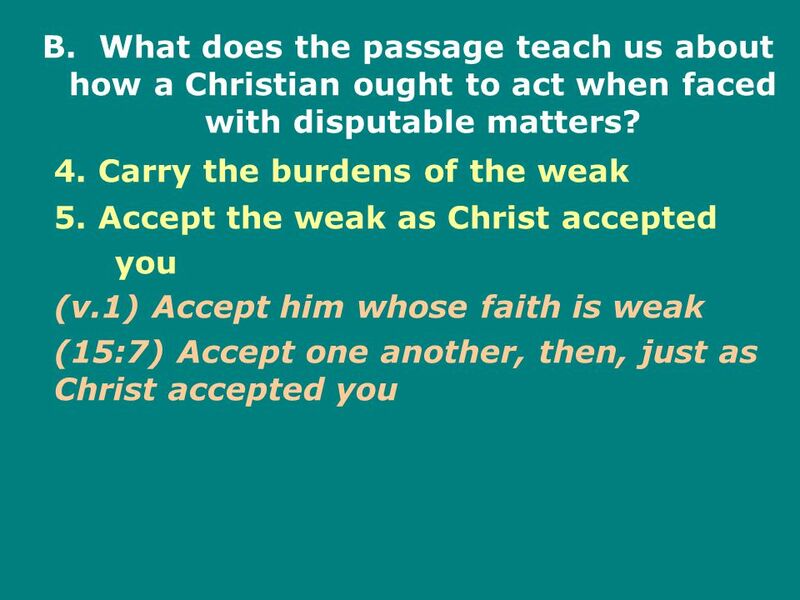 Accept the weak as Christ accepted you 6. Do not pass judgment on, look down on, or condemn other Christians or their views and practices (v1) Accept him whose faith is weak, without passing judgment on disputable matters (v3) The man who eats everything must not look down on him who does not, and the man who does not eat everything must not condemn the man who does (v10) You, then, why do you judge your brother? Or why do you look down on your brother? 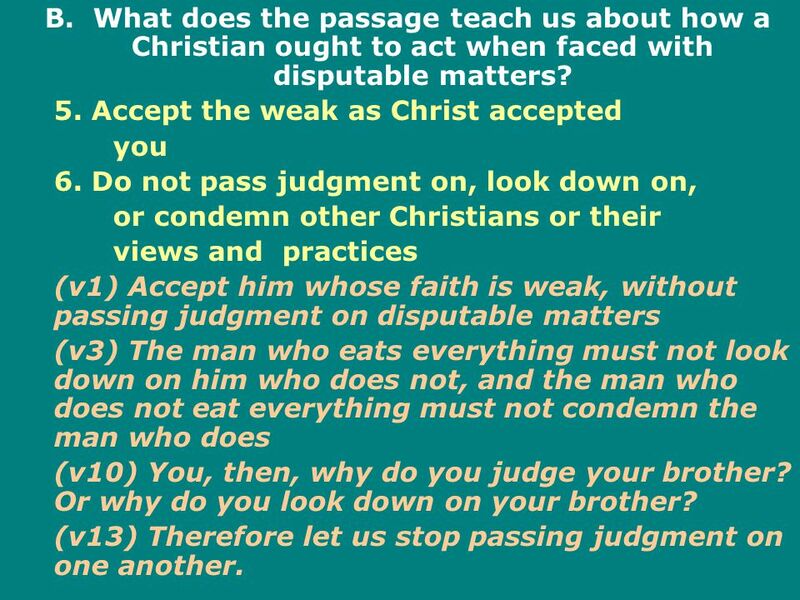 (v13) Therefore let us stop passing judgment on one another. 13 B. 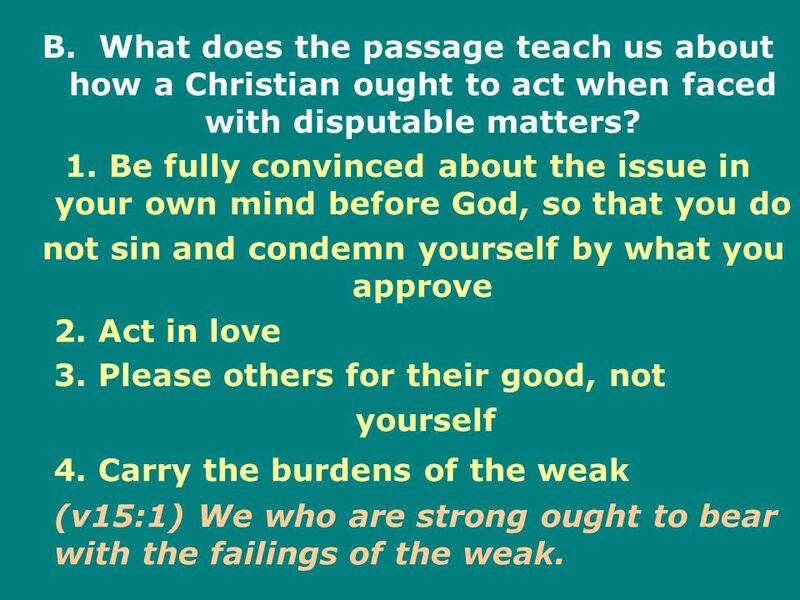 What does the passage teach us about how a Christian ought to act when faced with disputable matters 7. 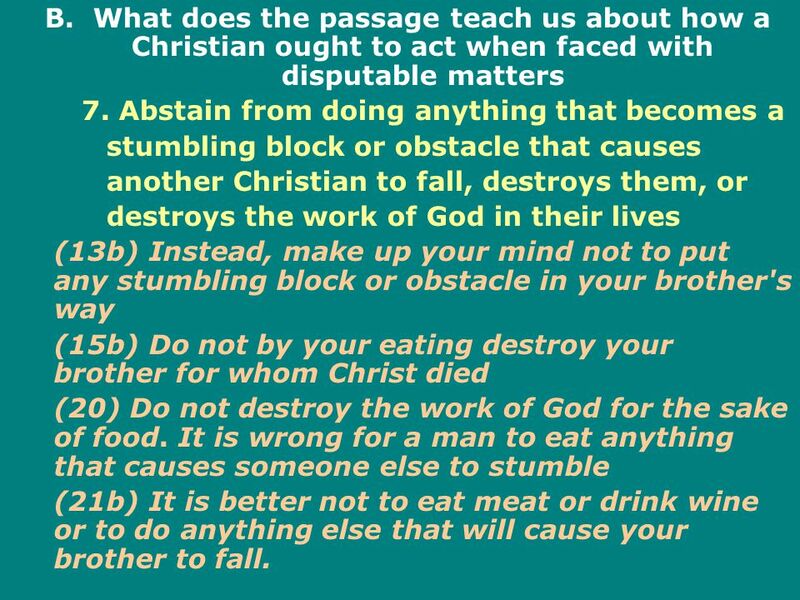 Abstain from doing anything that becomes a stumbling block or obstacle that causes another Christian to fall, destroys them, or destroys the work of God in their lives (13b) Instead, make up your mind not to put any stumbling block or obstacle in your brother's way (15b) Do not by your eating destroy your brother for whom Christ died (20) Do not destroy the work of God for the sake of food. It is wrong for a man to eat anything that causes someone else to stumble (21b) It is better not to eat meat or drink wine or to do anything else that will cause your brother to fall. 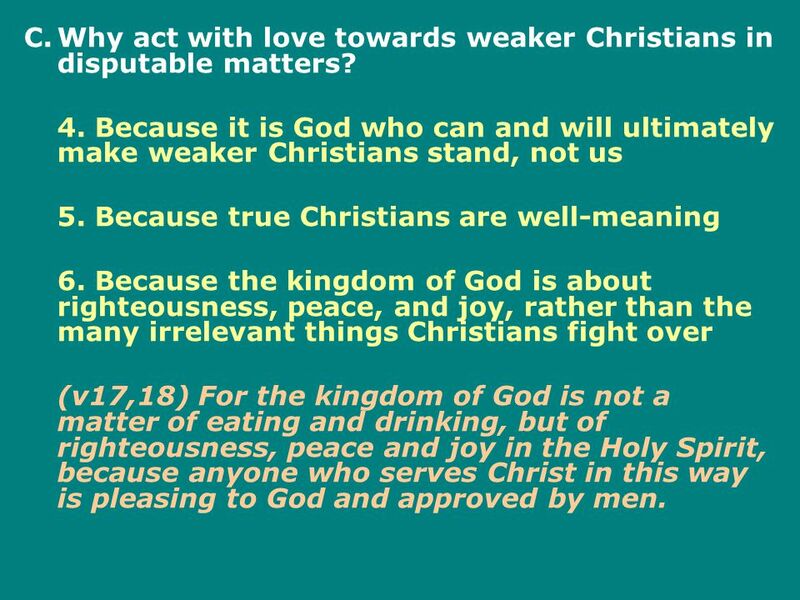 18 C. Why act with love towards weaker Christians in disputable matters? 3. 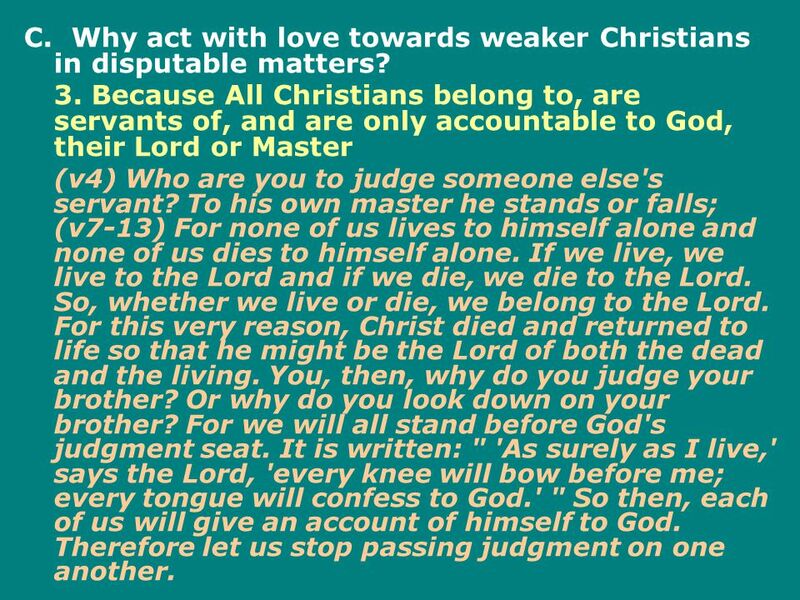 Because All Christians belong to, are servants of, and are only accountable to God, their Lord or Master (v4) Who are you to judge someone else's servant? To his own master he stands or falls; (v7-13) For none of us lives to himself alone and none of us dies to himself alone. If we live, we live to the Lord and if we die, we die to the Lord. So, whether we live or die, we belong to the Lord. For this very reason, Christ died and returned to life so that he might be the Lord of both the dead and the living. You, then, why do you judge your brother? Or why do you look down on your brother? For we will all stand before God's judgment seat. It is written: " 'As surely as I live,' says the Lord, 'every knee will bow before me; every tongue will confess to God.' " So then, each of us will give an account of himself to God. Therefore let us stop passing judgment on one another. 20 C.Why act with love towards weaker Christians in disputable matters? 3. 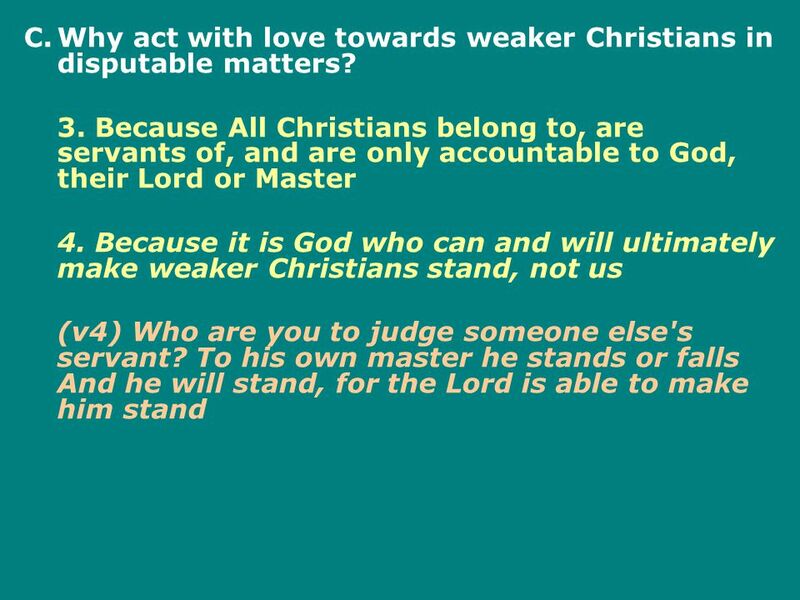 Because All Christians belong to, are servants of, and are only accountable to God, their Lord or Master 4. 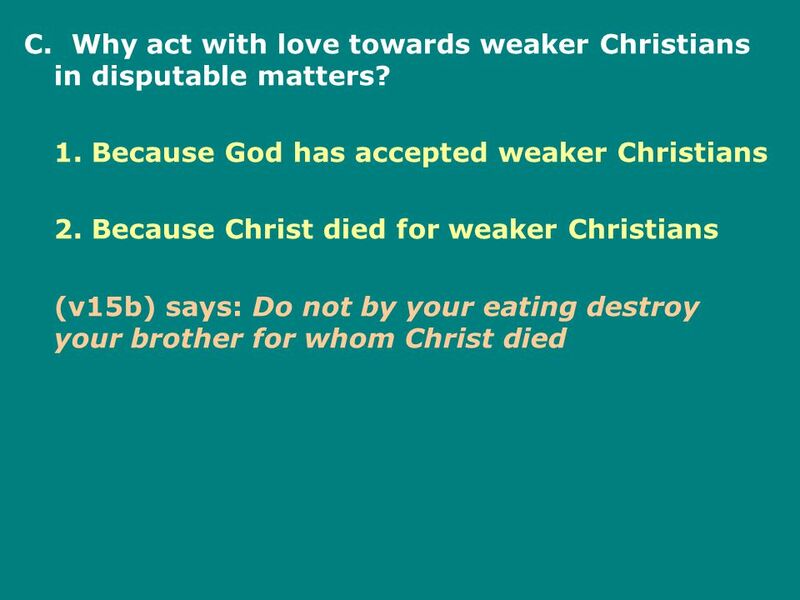 Because it is God who can and will ultimately make weaker Christians stand, not us 5. Because true Christians are well-meaning (v6-8a) He who regards one day as special, does so to the Lord. He who eats meat, eats to the Lord, for he gives thanks to God; and he who abstains, does so to the Lord and gives thanks to God. For none of us lives to himself alone and none of us dies to himself alone. If we live, we live to the Lord; and if we die, we die to the Lord. 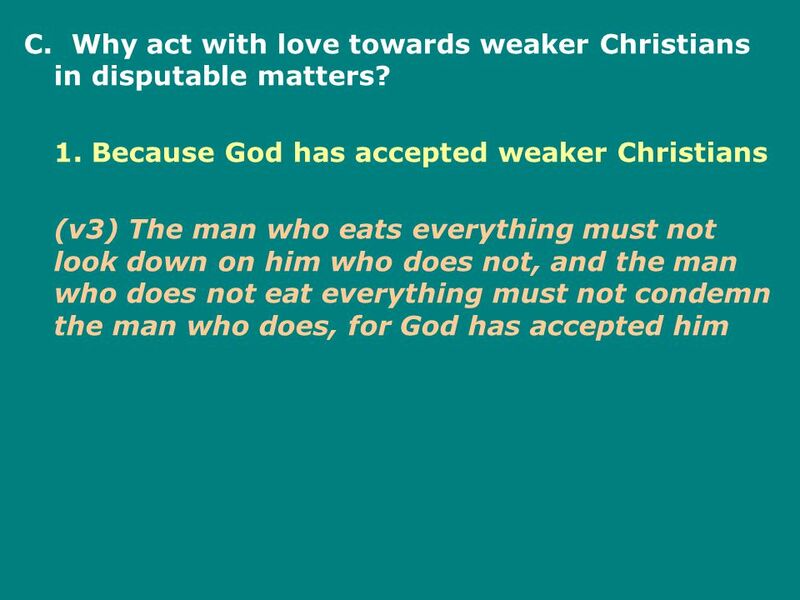 21 C.Why act with love towards weaker Christians in disputable matters? 4. 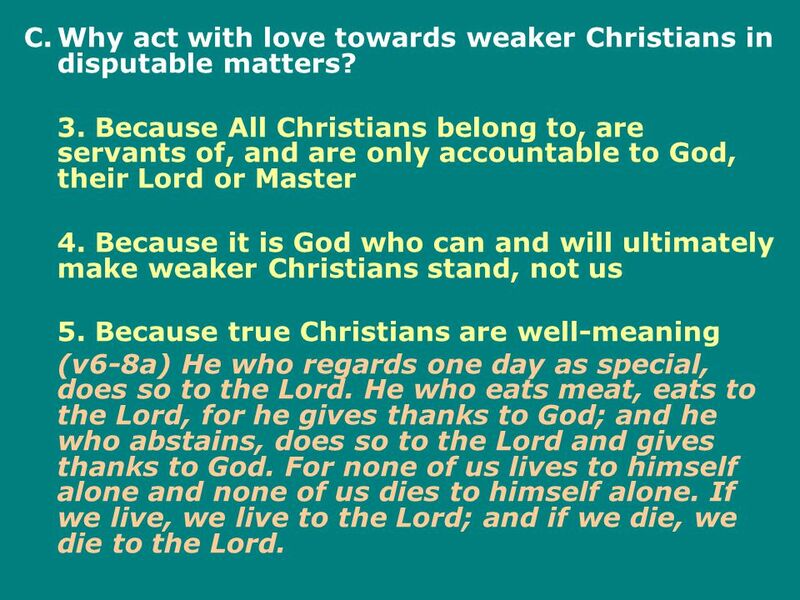 Because it is God who can and will ultimately make weaker Christians stand, not us 5. Because true Christians are well-meaning 6. 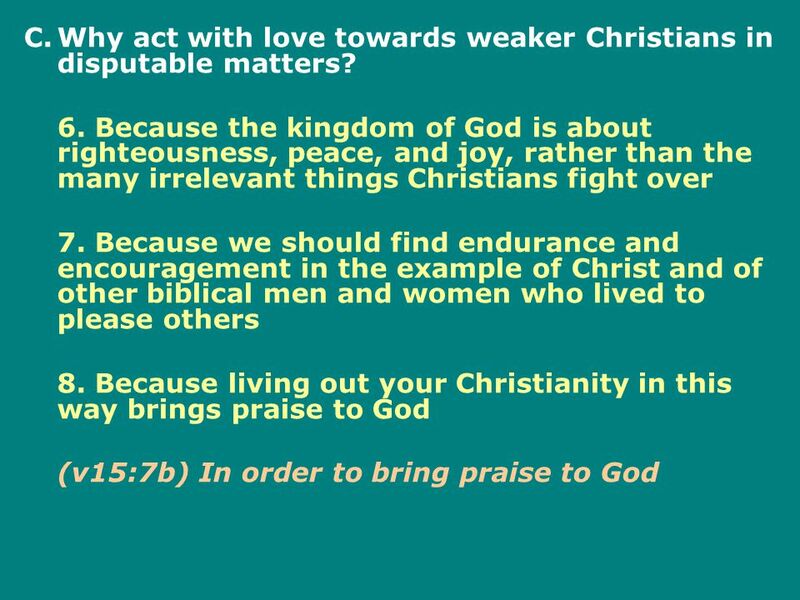 Because the kingdom of God is about righteousness, peace, and joy, rather than the many irrelevant things Christians fight over (v17,18) For the kingdom of God is not a matter of eating and drinking, but of righteousness, peace and joy in the Holy Spirit, because anyone who serves Christ in this way is pleasing to God and approved by men. 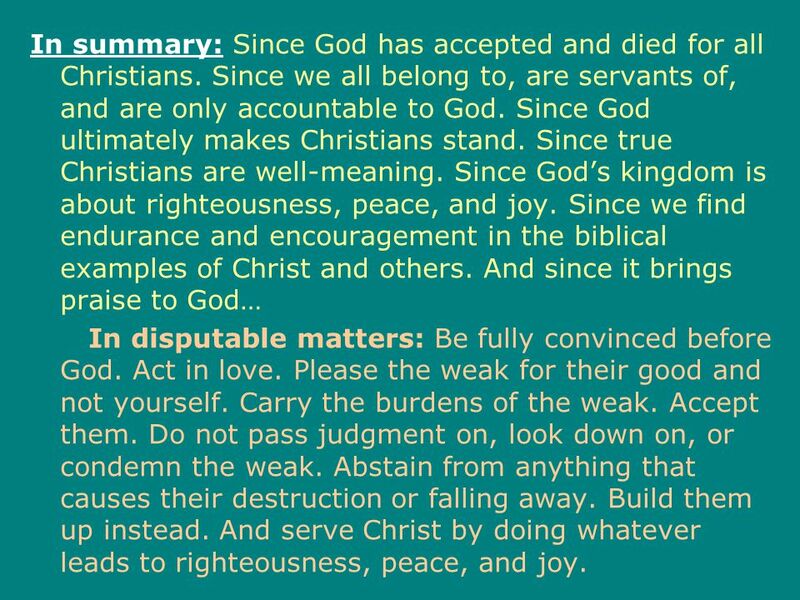 23 In summary: Since God has accepted and died for all Christians. Since we all belong to, are servants of, and are only accountable to God. Since God ultimately makes Christians stand. Since true Christians are well-meaning. Since God’s kingdom is about righteousness, peace, and joy. Since we find endurance and encouragement in the biblical examples of Christ and others. And since it brings praise to God… In disputable matters: Be fully convinced before God. 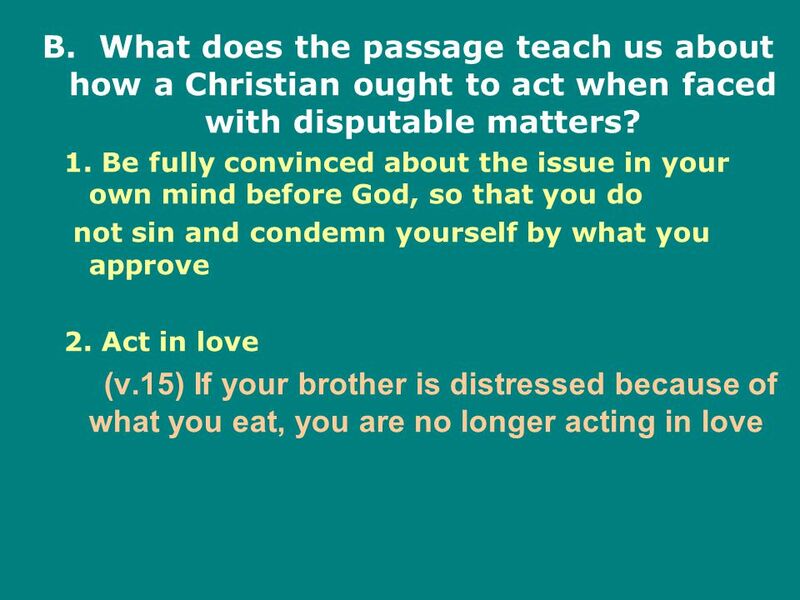 Act in love. Please the weak for their good and not yourself. Carry the burdens of the weak. Accept them. Do not pass judgment on, look down on, or condemn the weak. Abstain from anything that causes their destruction or falling away. Build them up instead. 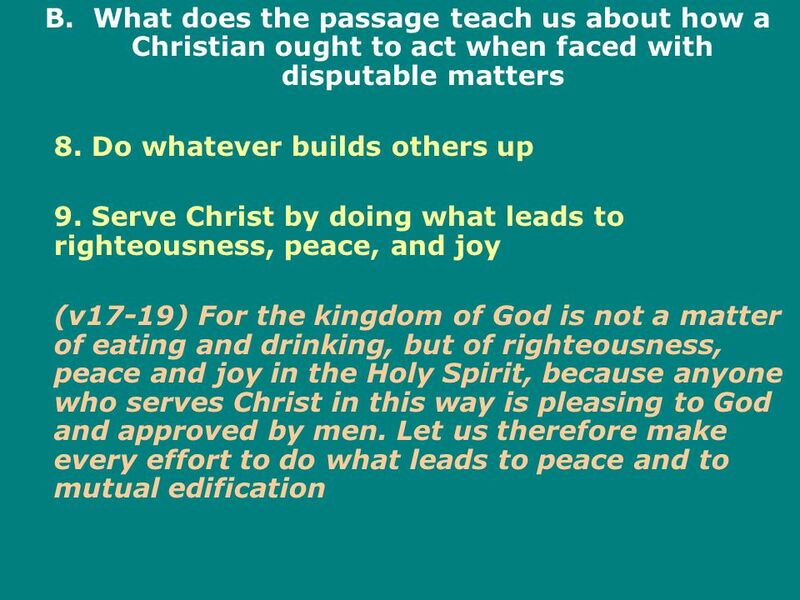 And serve Christ by doing whatever leads to righteousness, peace, and joy. 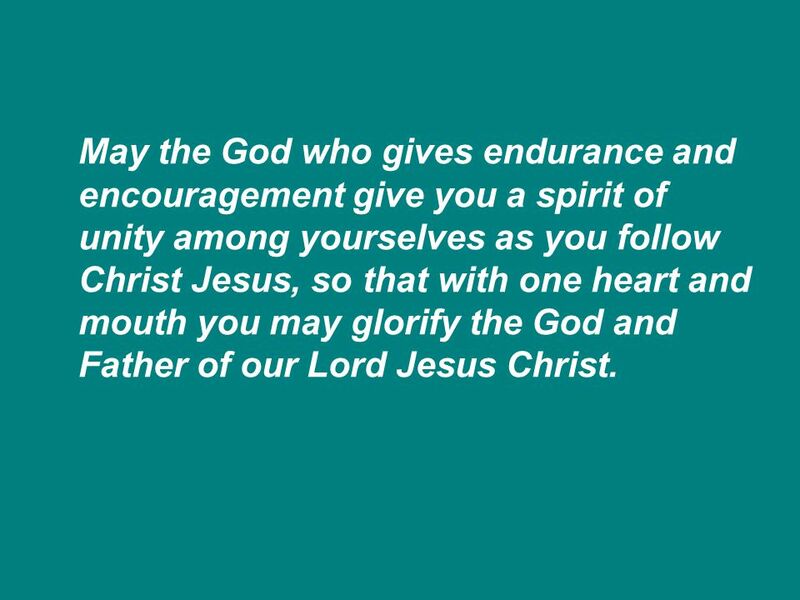 24 May the God who gives endurance and encouragement give you a spirit of unity among yourselves as you follow Christ Jesus, so that with one heart and mouth you may glorify the God and Father of our Lord Jesus Christ. 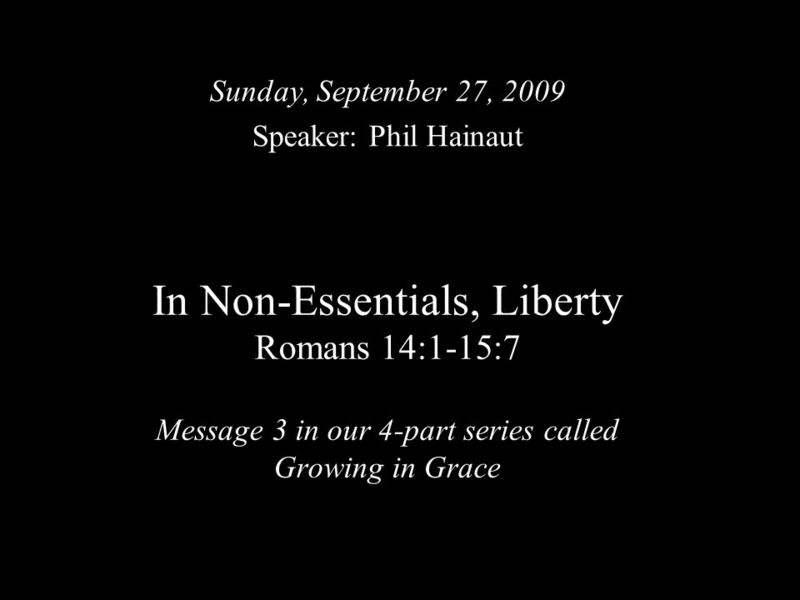 Download ppt "In Non-Essentials, Liberty Romans 14:1-15:7 Message 3 in our 4-part series called Growing in Grace Sunday, September 27, 2009 Speaker: Phil Hainaut." Its ALL about God (KIF Fall Series, Sermon 9). To have close intimate friendships with non-Christians in such a way that they can see the Holy Spirit. Romans 5:1-5 NIV 1Therefore, since we have been justified through faith, we have peace with God through our Lord Jesus Christ, 2 through whom we have. Romans 14 Faith, Freedom, and Finesse. 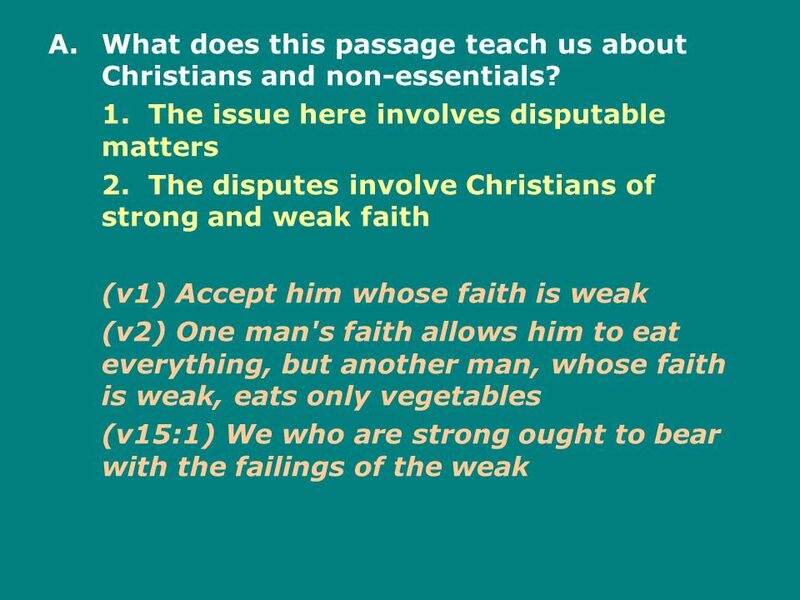 The Growing Church Romans 14:1 ESV (1) As for the one who is weak in faith, welcome him, but not to quarrel over. 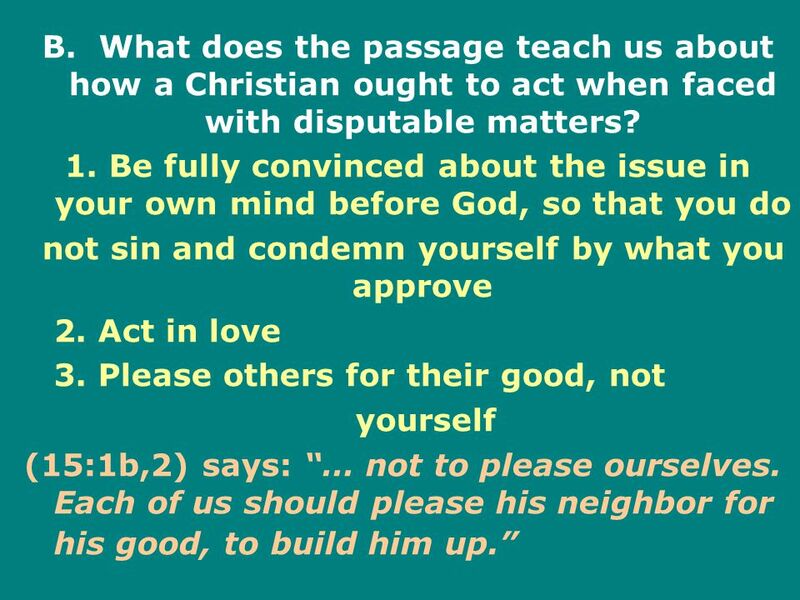 Key #3 - Building Others Up Galatians 6:1-6:10 Sunday, February 5, 2012 Jim Beasley. R. Henderson 8/19/07 Lesson # 96 1 Romans 14:19 – 15:3 19 So then we pursue the things which make for peace and the building up of one another. 20 Do not. Building Christian Harmony The Paradox of Christian Freedom. Last Week: Real Life - Conflict. Healthy and Unhealthy Ways to Conflict. DISCERNING GOOD AND EVIL Hebrews 5: For though by this time you ought to be teachers, you need someone to teach you again the first principles of. We Are Family! Romans 14. We Are Family! Romans 14. The Problem of Offense I Corinthians 8. Stumbling Block Romans 14: Therefore let us not pass judgment on one another any longer, but rather decide never to put a stumbling block or. Introduction How often do you make judgments about others who think/believe different than you? Fact The 27 canonical books of the NT were first written in Greek by 8 (or 9) different apostles or associates of apostles. For this very reason, Christ died and returned to life so that he might be the Lord of both the dead and the living. You, then, why do you judge your brother.